Seven funds reported their redirections to more than 50 groups doing work for peace, justice and humanity in the U.S. and beyond. Some of the redirections are from organized alternative funds, others come from groups of individuals who pool their resisted war taxes each year and then decide collectively on grants. Along with the group redirections, we know that individual war tax resisters around the country make their own redirection choices. The War Tax Boycott page of public signers includes a list of the many peace and justice causes that receive redirected tax dollar donations. Steven Funk receives a People’s Life Fund grant for Veteran Artists to #popthebubble — 2016 Granting Ceremony at Berkeley Fellowship of Unitarian Universalists. 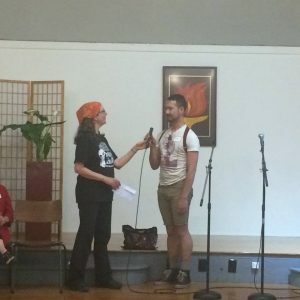 Northern California People’s Life Fund (founded in 1971) granted $20,000 in resisted war taxes to local community organizations at a potluck and celebration on April 19 at the Berkeley Fellowship of Unitarian Universalists. Grants were given to 16 groups including BAYAN-USA, Berkeley Food Pantry, East Point Peace Academy, Indigenous People’s Day Committee, Oakland Emiliano Zapata Street Academy, Prison Radio, Veteran Artists, and Young Workers United. New England War Tax Resistance was a cosponsor of a rally on a snowy and cold April 4 to protest General Electric, which is moving its headquarters to Boston tax-free. 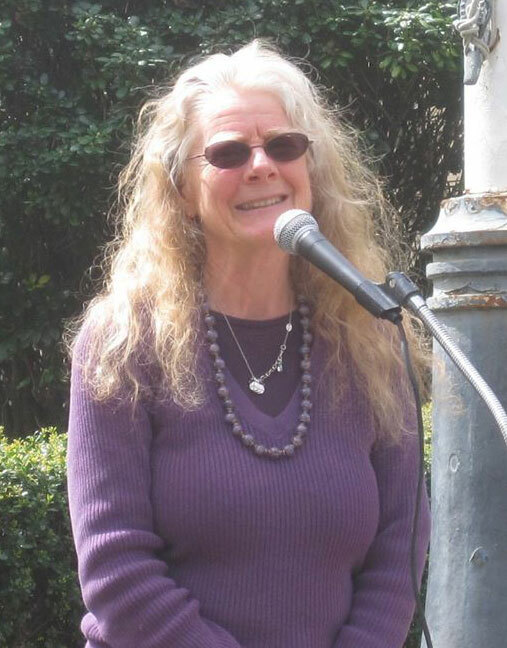 To the group of about 100 hearty activists, Mary Regan announced the alternative fund grants totaling $6,000 to local groups. She was surprised to be quoted in the Boston Business Journal: “Mary Regan of the group New England Tax Resistance, who told the Business Journal they believed that the $145 million in incentives, as well as the free rent that may be in the offing for GE, is money that should go toward public schools, public transportation and affordable housing, among other items they said were more deserving.” New England War Tax Resistance has been giving annual grants of redirected tax dollars since 1969! 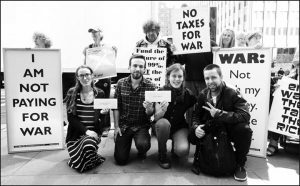 New York City PLF (founded in 1971) announced grants to four groups during a vigil on April 18, in front of IRS offices in Manhattan. A total of $2,000 was given to four groups: Not an Alternative, an art and activism collective; BK Rot composting operation; The New Sanctuary Coalition of New York City supporting those resisting detention and deportation; and, The Peace Poets music and poetry collective. Photo of grant recipients by Ed Hedemann. Southern California War Tax Alternative Fund (founded in 1979) held a press conference on April 15 in front of the San Diego Public Library and announced grants of $6,000 “from the Pentagon” to Amikas’ “Homeless to Housed” program, Peace Resource Center of San Diego, Alternatives to Violence/Los Angeles, Tri-Valley CAREs, Nevada Desert Experience, and 9to5 Working Women/LA. Read Cathy Deppe’s firsthand report of the redirection event. John Grueschow spreads the message of the Portland war tax redirection. Oregon Community of War Tax Resisters, Portland, held their public redirection ceremony on April 19 at Augustana Lutheran Church’s Community Room. They pool their individual resisted taxes and ended up giving over $6,000 to six local groups, including Books to Prisoners, Food Not Bombs, and the Returning Vets Project. Sue Barnhart announces redirections in Eugene. 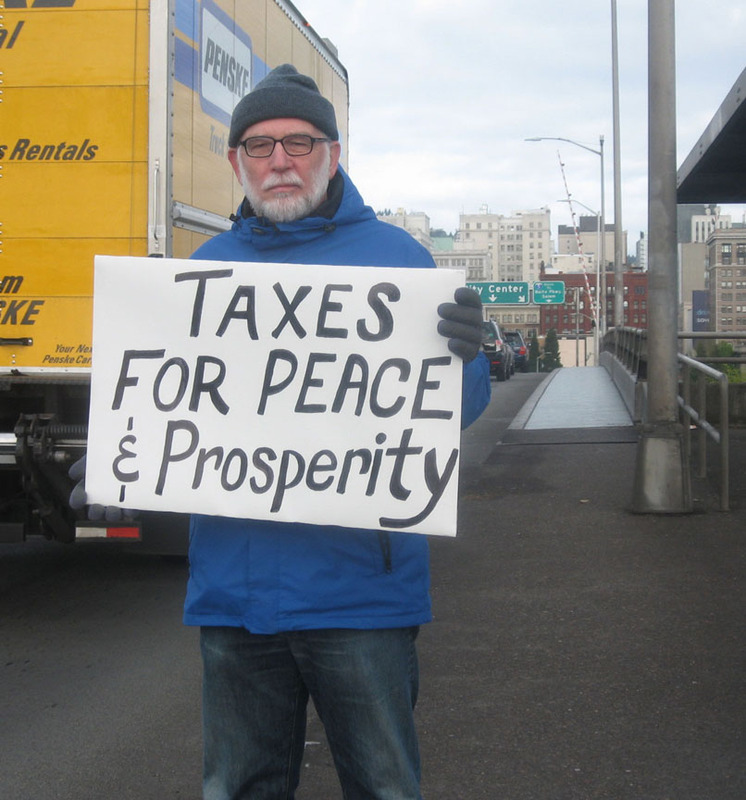 Taxes for Peace Not War! held a rally at the post office in downtown Eugene, Oregon, on Friday, April 15th. 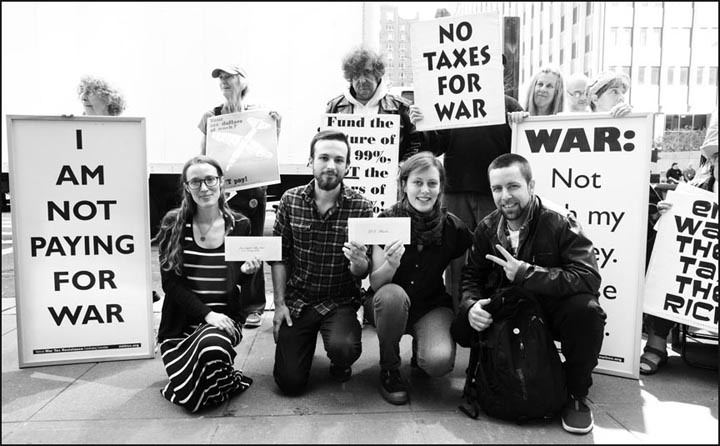 War tax resisters, Raging Grannies, members of the Community Alliance of Lane County, and friends sang, offered a penny poll to the public, and announced donations from redirected war taxes. Groups receiving grants included 350.org, Stand for Children, the local chapter of the NAACP, and Occupy Medical. Photo by Jain Elliot. Look for a link to her tax day photo album on NWTRCC‘s Facebook group page. Conscience and Military Tax Campaign Escrow Account split $4,000 evenly among eight groups: El Refugio Ministries and Alterna Community in Georgia for work on immigrant issues; Maine War Tax Resistance Resource Center; Peacebuilders Camp at Koinonia Farm in Americus, Georgia; Carolinas Human Rights Organizing Conference 2016 to be held in Asheville, North Carolina; Circle of Mercy Immigration Mission Group and community partners in Asheville; First Friends New Jersey and New York for support to immigrant detainees; and, Quaker House in Fayetteville, a safe space for Fort Bragg military personnel.